Signs for the many attractions that line the Strip in Las Vegas, Nevada in the United States. Las Vegas is a bustling city that never sleeps and there are so many attractions to see up and down the strip that twenty-four hours in a day is not enough. Flashing billboards, pamphlets, newspapers and the bright lights grabs everyone's attention to all of the attractions there are and the fascinating things to do. Every hotel that you walk into is decorated with fascinating displays and themes. Entertainment, casinos, restaurants, bars, lounges and first class service are just a few of the items to explore in each hotel. Shopping plazas are found throughout some of the hotels where souvenirs and exquisite clothing is sold. Photo of the night lights and signs that point tourists in the right direction of the many attractions in Las Vegas, Nevada. Hundreds of different vacation or tour packages are available in Las Vegas with a long list of attractions that you can do while visiting. 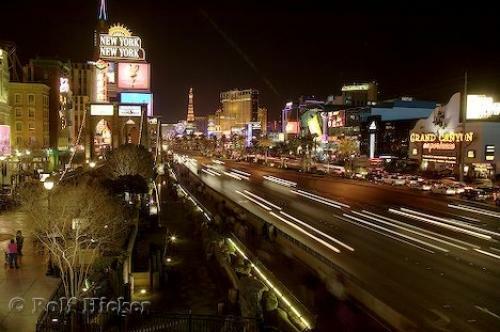 Las Vegas, Nevada is a place everybody should visit at least once, as there is no other place like it in the world. I photographed this photo with the digital SLR camera model Canon EOS-1DS, aperture of f/10.0, exposure time of 8/5 sec. on ISO 100, as always I used a original Canon Lens, the focus lenght for this picture was 28mm.